The violence of Donald Trump in Las Vegas. There’s an undercurrent of brutality bubbling underneath each Trump event. LAS VEGAS—With political events come protesters. Some attend for a particular issue, some for attention. But either way, they’re an inevitable part of electoral politics and most politicians have learned to deal with the natural disruptions that come with speaking in public. That is, unless the politician is Donald Trump. At a certain point in Trump’s Monday night speech at the South Point Arena in Las Vegas, Nevada, the real estate mogul had to compete for attention. Behind him, a man held a sign that read, “Veterans to Trump: End Hate Speech Against Muslims.” The crowd, estimated at 8,000 people, could see the man and the sign and started to yell. “Get him out!” said some attendees. “Throw him out!” yelled others. Trump noticed and voiced the anger of his supporters. “Get the hell out,” he said, as security removed the protester. The crowd booed and cheered and chanted (“USA! USA!”), and Trump continued with his address, moving—as usual—to attacks on immigrants, Muslims, and foreign countries. Trump continued as normal, but he was interrupted again. This time, he could see the protesters as they were hauled out by security. And this time, he had a little more to say. “You know what they used to do to guys like that in a place like this?” he asked the crowd. “He’d go out in a stretcher.” His audience cheered. A moment later, he went further: “You know we’re not allowed to touch him? The police are touching him gently and he’s smiling and he’s having a good time. I’d like to punch him in the face.” Again, the crowd went wild. This isn’t the first time Trump has voiced a proclivity toward violence. At one event last November, a Black Lives Matter protester was kicked and pushed to the ground. Trump later responded that “maybe he should have been roughed up.” Overall, Trump’s events have been marked by confrontations between typical protesters and his supporters, who react with anger and occasionally violence. At an event in Richmond, Virginia, for example, Trump supporters physically confronted a group of immigration activists. One attendee spit in the face of a protester. The activists were escorted out. It’s true that elections inflame passions. And that the anonymity of crowds can breed the worst in people. But the violent rhetoric and violence of Donald Trump’s campaign is unusual. You don’t see this kind of behavior with other candidates, whether it’s Bernie Sanders and Hillary Clinton on the left or Ted Cruz and Marco Rubio on the right. When they face protesters or hecklers, they deal with them in a polite, civilized way. Cruz will even make a joke about the First Amendment, praising the protesters for using their constitutional rights. But while the violence around Trump is unusual, it’s not surprising. Trump’s entire appeal is built around aggression and, yes, violence. To call for mass deportation, for example, is to entertain and endorse state violence. To back waterboarding and recite violent fantasies of wartime revenge against Muslims is to do the same. Donald Trump isn’t just running as a man who “makes deals,” he’s running as a nationalist and a bully who will humiliate the nation’s adversaries—actual foes like Iran, as well as alleged ones like China and Mexico—and restore America’s symbolic manhood. When Donald Trump says, “I’d like to punch him in the face,” he’s not just talking about a particular protester. In a speech laden with attacks on other countries for “stealing jobs” and on whole groups of people as dangerous and suspect, an open wish for violence is the subtext of Trump, made text. The good news is that we’re still far from serious violence. But watching and observing Trump and his supporters, I’m afraid we’re not far from when that becomes a possibility. What happens if Trump begins to lose and starts to lash out against opponents? Or if he becomes the nominee and suddenly is met with concerted opposition from the people—Latino immigrants, Muslim Americans, even black Americans—who he has attacked and demogagued? 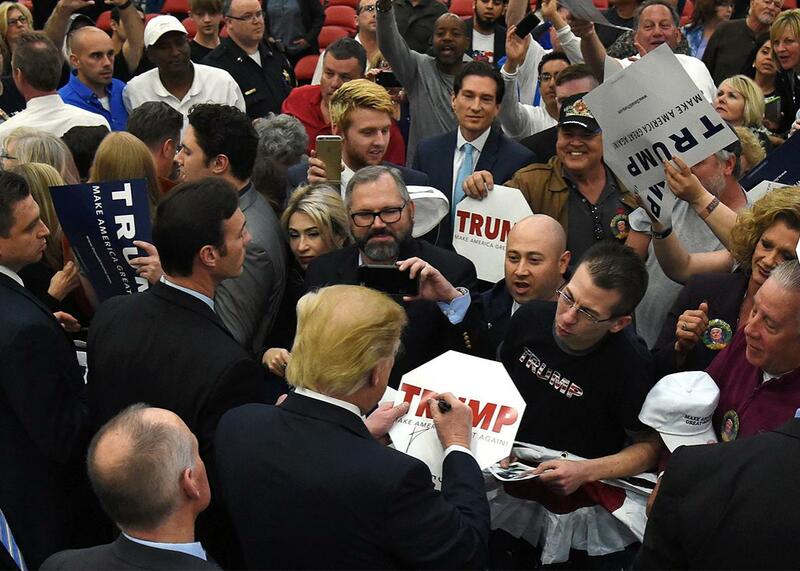 Will the Trump movement restrain itself? Or, following their leader, will those backers respond with their hands in fists?